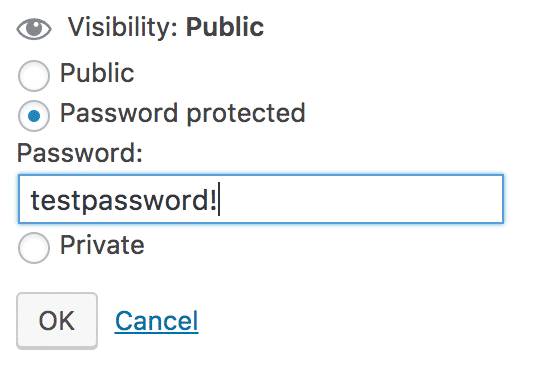 It's so easy to password protect a page in WordPress. In the top right of your post/page editor. Just click "Edit" next to Visibility. This will bring up a new interface with a couple radio selectors. Pick "Password Protected", then enter the password. Click "OK", then Update or Publish the page. Boom... you are good to go, that content is protected. Come back to this interface to change or remove your password at anytime. WordPress and any other software at that always has those small little bugs. 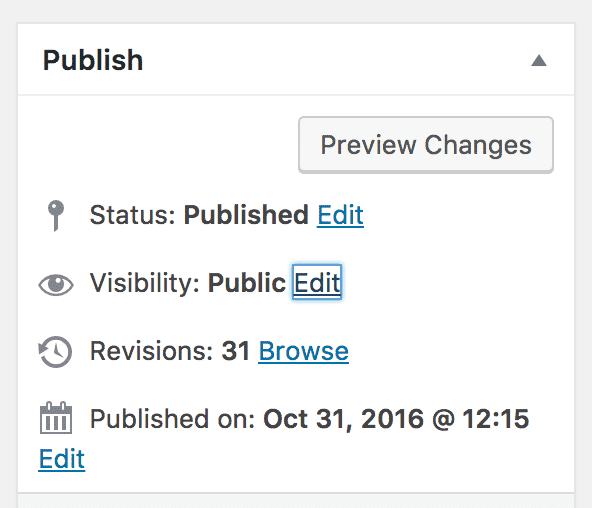 WordPress is actually great and usually finds/fixes them before you even know it. But, I've noticed on a couple themes that when you do this the password field will not be active. You will obviously hear something weird from your visitors like "IT DON'T WORK".. what's going on here is that the button is overlapping the password field, so you cannot click into it. It's not happening visually as you can see it looks fine, but code-wise the button is covering up the password field. Again, this doesn't happen all the time, but if you get people complaining about it not working, I'm betting it will be this issue. Let's be honest here, we are not talking government level protection here (hahahah... yes, that is a joke, obviously this is more secure than government level protection). But, it's obvious someone who you give the password to, could just give it to someone else and things work fine. I tell my client that is an awesome thing! If people are passing around passwords to get to your content, then you are doing something right! If you out grow this method, we suggest moving into an actual account method where individual users have their own login to your website and you can start creating a real custom portal type of environment to interact with your customers. But... that's step 2, for step one just throw a password on there and make people feel special that they have access to your "exclusive content"! There are many reasons why you should password protect content on your website. First off, there may be some proprietary content that you only want employees to see. If it's very simple and does not require an employee portal, just throw up a page with a password and tell your employees to check it everyday for updates on company information. Another example as seen from the example screenshot on JessGlazer.com, you can provide customers with a private page giving them proprietary information just for them since they are members. This is huge because it makes them feel special, it makes them engage more, and it increases the value of your content... if it was cheap information everyone would be able to see it! Is this a standard option in all WordPress installations? Good question… yes! This feature is standard on all WordPress installations. You don’t need any plug-ins or anything, it works right out of the box. You can do this on posts or pages as well. hahahaha… I can’t believe how easy this is. Thanks for posting, I needed this. I just tried this, I feel like a web developer now! Thanks for the info. What happens if people share the password? Wouldn’t that defeat the whole purpose of this? Doesn’t really seem too secure to me. Patty, thanks for posting and yes, you are 100% correct. This is not a secure method to make sure your content is protected. It’s just a quick and easy way to lock it and give select people access. Yes, they can share the password. If you are looking for a super secure method we would suggest a membership style portal. This method would require each user to have their own account. They login each time and we would track their IP address each time they login. There are great tools to identify misuse with this, we can tell if they are logging in many times from various places in the world. Then, we can identify the cheaters. Just to recap, this password method is not very secure, just a quick and easy method. Contact us if you want to take it to the next level with a membership style solution.